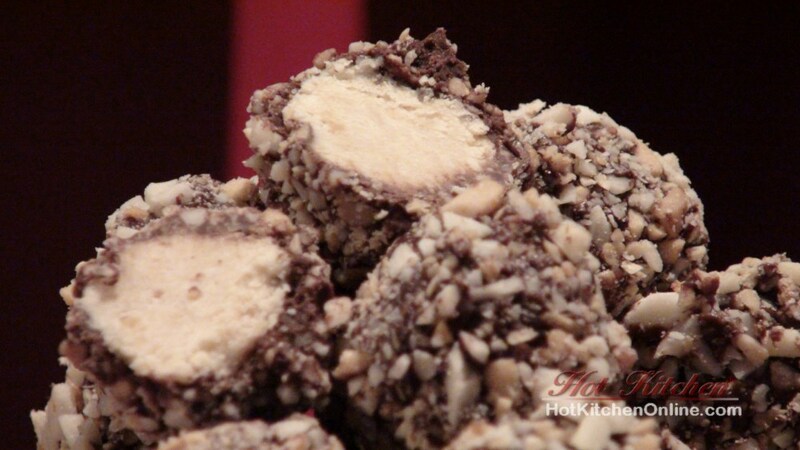 This no bake cookie recipe was one of the 14 cookies we made at the cookie exchange at the In Good Taste Cooking School’s 2012 annual cookie exchange. In just about three hours, 15 participants turned out about 1000 cookies, then we split them up at the end. Everybody looked quite happy as they left with overly full container of cookies. My deeply rooted desire to turn out mountains of Christmas cookies was also satisfied. This kind of event is something I will have to organize in the future, for sure! *The original recipe calls for graham crackers, but the butter crackers make the cookie less sweet, especially with the maldon sea salt crystals gracing the outside of the cookie. Combine the powdered sugar, cracker crumbs, butter, and peanut butter together with your fingers in a large mixing bowl until completely combined. Roll the dough into three-quarter inch balls, and place on a baking sheet. As you roll, make sure you get your chocolate melting. Melt the chocolate and oil over a hot water bath. Stir occasionally to ensure even melting. Remove from the heat once the chocolate is melted, but keep the hot water bath going so that you can rewarm the chocolate as needed. Also put about ½ cup of the nuts in a shallow pan such as a pie pan or plate. Sprinkle a couple of pinches of Maldon sea salt over the nuts, and aim for just enough to add a only a few flakes to each cookie. (Start small and taste test to dial it in.) Replenish as needed during the next step. 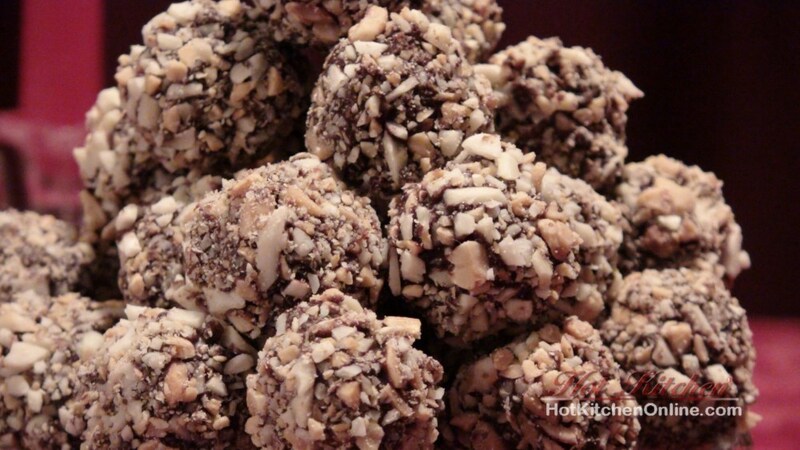 Carefully dip the balls in chocolate, then roll in nuts. Return to the baking sheet and allow to dry. Who wouldn’t love a mountain of these? Warning: they go quickly. 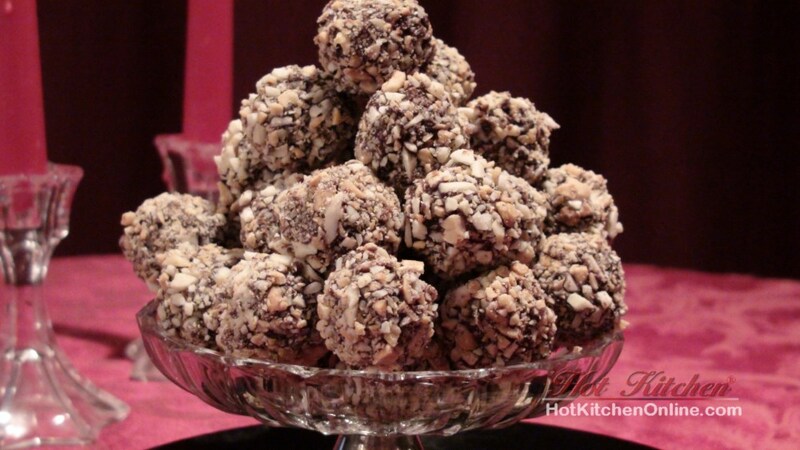 This recipe comes to us from Great Cookies by Carole Walter. One of my favorite cookbooks. Ever. This is the salt. I have a serious love affair with Maldon Sea Salt! Nice grocery stores also carry it. Catch our latest show here or on our Home Page or sub us on YouTube, Follow us on Blip, sub us on iTunes, etc. Disclaimer: Page contains affiliate links.